Watching a movie during the summertime can sometimes be a damn right confusing experience. After all, if the weather is nice and hot and sunny outside, why would you want to be cooped up inside watching a film? Even if the film you're watching is a good film, a damn good film! 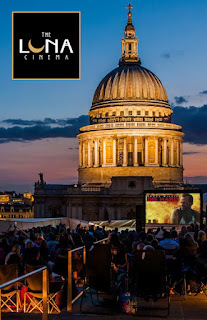 But then again, if you're doing that, then that would mean you haven't heard about the UK's leading producer of open-air film screenings, The Luna Cinema, who are happy to announce their new summer calendar, packed with more screenings than ever before. From April to October, 2018, film fans across the country can choose from over 175 outdoor screenings taking place all across the land. Venues include some of the most prestigious and historically important sites in the UK, ranging from Royal Palaces, such as Hampton Court and Kensington Palace, to Castles and Manor Houses, such as Warwick Castle, Chatsworth House, Westminster Abbey, the Royal Botanical Gardens, and Leeds Castle, to name but a few. Some of the new venues joining the Luna this year include York Minster, Guildford Cathedral, Belvoir Castle, Royal Windsor Racecourse, Danson House, Bolton Abbey, Osterley House, and Peckham Rye in London. As for some of the new films they'll be showing, audiences will be treated to a fantastic selection that includes this year’s big award winners: The Shape of Water, directed by Guillermo del Toro; Three Billboards Outside Ebbing, Missouri, directed by Martin McDonagh; and Dunkirk, directed by Christopher Nolan. Film fans will also have the opportunity to watch Darkest Hour, starring Gary Oldman, in his Oscar-winning performance as Sir Winston Churchill in the very grounds of Churchill’s birthplace, Blenheim Palace. Yet for those of you who are looking to exercise their vocal chords at a somewhat iconic venue, there will be a screening of the musical phenomenon, The Greatest Showman, starring Hugh Jackman, Zac Efron, Michelle Williams, and Rebecca Ferguson, at Knebworth House: A venue famously known for its rock concerts. Other movies also added to this years schedule include a number of popular classics that audiences enjoy year after year after year, such as Dirty Dancing, Casablanca, Mean Girls, Pretty Woman, The Goonies, Harry Potter, and lets not forget those of you who are brave enough to enjoy Jaws while sitting in a dinghy at Brockwell Lido. As always, The Luna Cinema audiences are welcome to bring along picnics to each of their screenings. However, all events will have fantastic hot food for sale and a full bar on site (in partnership with headline bar sponsors, Estrella Damm). Premium tickets are available at all screenings, which include a branded director’s chair in a prime position in the arena, fast-track access, and a complimentary drink at the Luna Bar. Where: There will be 175 events based at various locations throughout the UK. When: It starts at the end of April and finishes at the start of October. How Much: Ticket prices range from £20 to £9, depending on age range, where you'd like to sit, and status. Now for more details, including event location, prices, and other such paraphernalia, please check out the official website located at www.thelunacinema.com. Or alternately, subscribe to their facebook page or twitter stream.